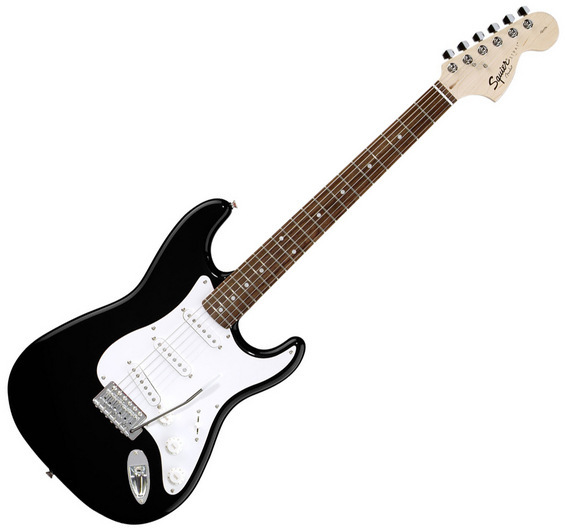 Squier Affinity Strat guitar in Black with Rosewood fingerboard. A pretty safe place to start as a beginner. Tried and tested and used in hundreds of schools by thousands of students and many adult learners too. Dressed in new eye-popping finishes, these Fender-designed Stratocaster guitars have a great look and feel. With a contoured alder body, bolt-on maple neck with rosewood fingerboard and late '60s headstock, three single coil pickups and standard tremolo system, the Affinity Series Strat guitar has all the vintage vibe at a fraction of the price.